October through February is prime carrot season in Arizona, so don’t hesitate to get out those carrots and use them to your heart’s content! Despite the cooler weather season of carrots, you can have access to them year-around thanks to our abundant produce aisles in the grocery store. Carrots are a great source of vitamin A, fiber, and they provide vitamin C, vitamin K, calcium, potassium, folate, and more! 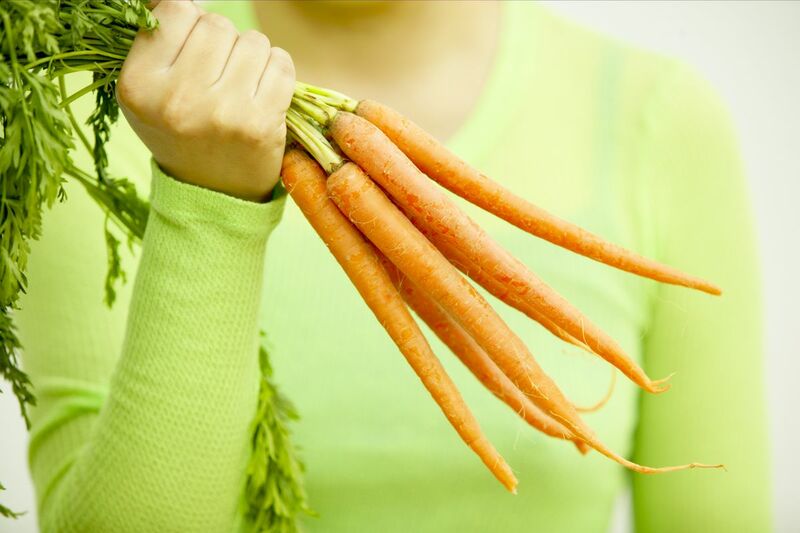 You may be familiar with the benefits that carrots can have on vision, but did you know that they are antioxidant-rich and can help prevent several forms of cancer too? This article highlights a few studies which show the advantage of consuming carrots in the battle against several types of cancer. If you’re like me, you love carrots: raw, cooked, juiced…it’s all amazing! I recently bought a huge bag of carrots and didn’t nearly eat them as quickly as I should have. Sound familiar? On my day off, I came up with a few ways to use the carrots before they went bad. Carrot Apple Ginger Juice – To feel refreshed and rejuvenated. I was able to contribute the carrot and ginger pulp from the juice into this carrot-ginger dressing for one amazing salad! Sautee carrot slices in the coconut oil and add spices about 8-10 minutes or until softened but not mushy. If you need some added sweetness, you can add a pinch of sugar or a nice spoonful of applesauce. Enjoy warm! To make this carrot dessert a masterpiece, a small dollop of banana ice cream over the top is delicious! When I have an abundance of any of these ingredients, I love to simply roast them and have a great side dish. You can alter the amounts or eliminate any of the ingredients. Peel and chop the vegetables into ¾ inch pieces (try to keep the vegetables roughly the same size). On a large baking sheet, toss vegetables with oil and add pepper generously. Spread in a single layer and bake for 50-70 minutes, tossing the vegetables once or twice until all the vegetables are soft. Season with salt to taste. You might add quartered Brussel sprouts or cooked beets if you have them on hand. Toss vegetables in either rosemary, thyme, or parsley for some added savory flavor. This entry was posted in Food, Grocery, Health Tips, Healthy Eating, Recipes. Bookmark the permalink.